There are instances when following user data will lead you to new areas of opportunity, and there are times when unleashing AI and machine learning will yield even better results. Olesia Kuznetsova, who heads mobile at Social Discovery Ventures based in Moscow, draws from her experience managing mobile marketing efforts for the company’s 30+ dating applications. She shares the best practices that power her approach to data-driven acquisition and engagement, and she discusses the role of AI in mobile and app marketing and her company’s own efforts to establish and AI research center on-site. Hello and welcome to Mobile Presence. I’m your host, Peggy Anne Salz, Content Marketing Strategist at Mobile Groove, where I plan, produce and promote content that allows my clients to reach their performance goals and scale growth. And of course, growth as always is what it’s all about here because this is where we get the inside track from the UA experts, app marketing ninjas, people out there who know how to move the needle on mobile growth. It’s success in this case that has earned them the title of Mobile Hero as chosen by Liftoff, a full-service mobile app marketing, and retargeting platform, and we’ve had a great series up until now, I encourage you, of course, to go back and listen in. We’ve been talking to a lot of Mobile Heroes, that’s their name, that’s their title, and how they became that – we’ve been talking to a lot of Mobile Heroes up until now, and I encourage you to go back and listen in to earlier episodes and what we’re looking at is across all of these shows, what is it that they’re doing and doing right because these are the lessons that can help you also move the needle on your mobile apps. So, with that, I’m going to welcome our newest Mobile Hero, she’s Olesia Kuznetsova, she is Head of Mobile at Social Discovery Ventures. Olesia, great to have you here. Hello, Peggy, hello everyone, thank you for hosting me. Well, it’s great to have you and what I love is that you know, we have such a great mix, it’s just an eclectic mix of people from around the world literally because, in your case, I believe you are based in Moscow. Is that correct? Yes, we’re historically based in Moscow but still operate globally. And of course that gives you a different view not only just globally but Social Discovery Ventures, as a little bit of background for our listeners, is an international umbrella brand for a group of technology and software engineering companies that provide platforms for social discovery, personal development and online entertainment. And, you manage 30+ dating apps all around the world but maybe you can give me just a little bit more of an insight into what you’re doing at Social Discovery Ventures, Olesia. Speaking about our products and now our company, we’re mostly focused on two things. The first one is developing there as you said, the social entertainment and especially dating applications. So, we are trying to find the right niches on the market to connect people altogether, so we’re having the global brand name dating.com, we’re having the brands, for example, for travelers like travelmates.com, we’re connecting also senior people at datemyage.com and so on and so forth. So, we’re just trying to find, to connect the most close audience altogether. And the second part of our business is like can be obvious from there, our name is Investment Business, so it’s venture business and we’re especially investing in arts, in social technologies, in also interested in blockchain but still not, and our owner, the founder of the company, is investing in the different aspects of philosophy. Well, you know, what’s fascinating about this is the breadth of what you need to do and manage as Head of Mobile, so it’s like just to get an idea, it’s quite a lot but your chief focus as Head of Mobile – let’s start with your background. What is it that you were doing before joining that makes it possible for you to manage such a wide range of mobile products and presences, really? Before I was doing practically all my life, I was doing marketing and business development for different companies. First I started doing and dealing with dating about ten or even eleven years ago for the most popular still and most huge Russian brand called Mamba. Then I moved to the gaming industry and spent there about five or seven years mostly focused on business development and international user acquisition. And after that, it happened still that I get a technical tech experience for peer to peer financial and fintech platforms, and I was dealing with – it was not only with the acquisition but mostly with the product and their users’ experience, and then I joined the Social Discovery Ventures and am now Head of Mobile and responsible here for the marketing acquisition public relations and so on and so forth, and for another part, for the development user experience, customer separate and other stuff. So how does that work, does that sort of go hand in hand that you have to think about the user acquisition at the same time you’re thinking about the product, developing the product, thinking about the journey? How is it that you did that in parallel, or – are you truly a superhero because you’re doing all of this at once? No, I don’t feel like I’m a superhero but the thing is that everything, all those two processes, I really base on data because you need to know how your customers behave yourself inside the application so you just build the data clusters, you categorize the customers on different groups, you’re just watching their behavior, you’re trying to determine their needs and what do they want from your app and then you just build the users acquisition based on the knowledge you’ve got from the current users. You’re trying to find the lookalikes, you’re trying to suggest something new to your possible customers, you’re trying to find the new user acquisition sources to find the right platform where you can attract your future customers. So that’s not like a parallel process, those two processes are based on each other and they’re completely mixed. And of course as you stated, and many have stated, it’s data-driven marketing, if it’s marketing at all, in mobile, it’s data-driven. But of course you have the difference that yours is a very high touch app as well, we’re talking about dating, we’re talking about finding travel companions, also social games. There’s a real social element here. I’m just curious because there is no real answer, Olesia, so you’re not going to have it, but your view is really valuable on how do you balance the high tech and the high touch so that you’re making those data-led, data-informed decisions, but you’re also keeping in mind you have to be watching human behavior as well? This is everything but first of all the predictions and then about the segmentation, and the third part is about are a little bit of luck and your experience. So, it’s not always you can just predict everything and using artificial intelligence and all the data-driven systems, you can’t always like say that those customers will definitely behave themselves as you expect it. So, it’s a little bit of luck in this case. I had a great example from my practice how we were trying to connect our Arabian EMEA customers with the others, so we just expected that our Arabian customers would likely date with their neighbors and with those who live side by side on the same street, in the same city but we actually failed at that time and the prediction was completely wrong because we started to watch what all those customers have been doing inside the apps, what did they like, how did they open profiles, which is their customers journey, so on and so forth. So, we figured it out that they mostly are eager to date internationally but not in their own hometown and then we were trying to figure out who’s the best match for them from the international market, found Latin man and Latin woman and that was a perfect match, according to usage of their applications, revenues and so forth. So that’s a great point because you go into what you’re doing, into marketing, you have certain assumptions and it’s great to have those as a guidance but the reality check is always going to be the data and we have to go to a break right now, Olesia, but listeners, don’t go away because when we get back, we’ll talk more about data-driven marketing and also the role of AI in making decisions that have real business impact. So don’t go away, we’ll be right back. Hello, we’re back. Welcome back to Mobile Presence. 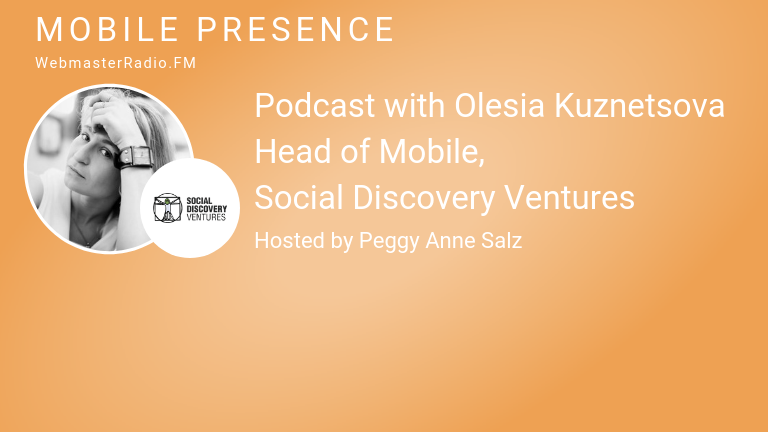 I’m your host, Peggy Anne Salz with Mobile Groove and today of course we have Olesia Kuznetsova, she is Head of Mobile at Social Discovery Ventures. And Olesia, right before the break, we were talking about, you know, that interesting sort of Eureka ah ha moment, when you’ve been thinking about your assumptions, your marketing assumptions make perfect sense, the data tells you something else. So it told you basically that your users would like to be matched with different people – obviously, you did that because you’re a successful app company, but what else did you have to do in your UA and in your approach to match what the data was telling you? So, as I told you before, like there was a quite successful users acquisition, we were trying to match our Arabian customers internationally for their travel plans and we would try to follow up was this matching successful or not, have they really had their mutual travel experience? So we used actually at that time we used actually the content marketing, like tell us your story please, tell us about your successful trip – was it successful, have you been happy at the time? So, we’ve got, I actually don’t remember but quite a lot of answers from our customers and then we used that content towards our new acquisition, like telling our potential customers the success stories that we had to guarantee the best performance, the people will see that this service really works, this is the proof of all the happy trips, the successful usage and so they can also join the service and try their luck. We also used the push marketing and with those stories, for those people who stopped using our application, we were sending the push notifications like Hey guys, that’s your fellow mates with the same user that used also our application, so Hey guys, we have a success story – maybe you can give a second try for our application, maybe we can find you the right match, so we were trying not only to acquire new customers but we were trying to re-engage our previous ones using that insight that we’ve got from matching the target group with the international travelers. 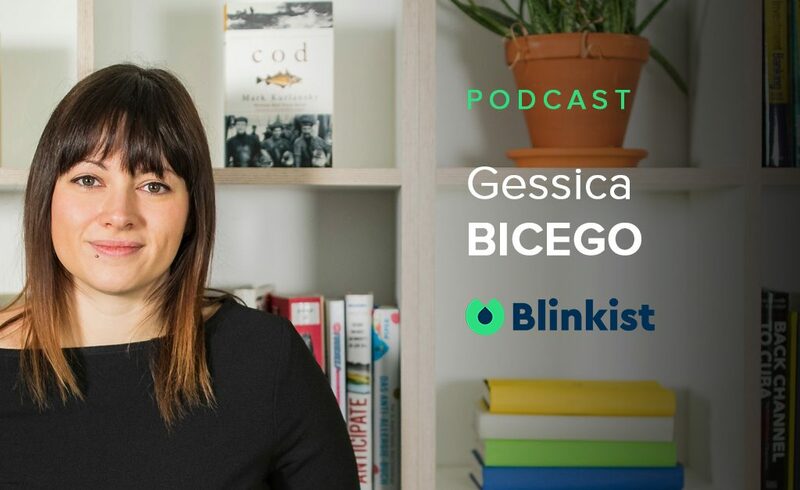 Of course, when you’re talking about engagement, at one level that’s about being effective but it’s also about being emotive and you’re very focused on data as you should be, Olesia, at your company, to get good results. How do you follow the data to engage and re-engage your users? In our company, I will start with the re-engagement because in our company, the reengagement is absolutely based on data and on the assumptions that those customers who left and might need again. So we’re not mostly like relying on some kind of intuition or luck or some assumptions, but for reengagement and to predict their possible behavior and also to gather the information, the direct and quite clean information about why those customers probably left or are not using the application. Sometimes, the reasons, I can give the example that sometimes the reasons are quite simple – the most recent answer is like I forgot that I’m having this app – this sounds like ridiculous – they don’t like – our customers like, they are not having some problems with the app, they are not unsatisfied with the application, they just forgot about that they are having this app. So, in this case, we do see the problem that we’re not interactive, we are not interactive enough for the customer, we are not like communicating with them, sending brochure emails or some kind of that stuff, we’re not reminding them, this is the first point. And the second one, we’re not showing them great results and great matches for this customer because there is enough interaction, if there is enough communication inside the app, if the user is engaged and happy about these communications, he is not like left the dating app, he is trying to go on the dates, he is trying to chat and chat and date with the new people again and again before he will find his perfect match. So, that’s why we know there’s all this way and that’s why all our reengagement is based on the data. But our engagement is a little bit different because we know everything, I hope so that we know everything but still not, about our customers but there is some kind of – the element of luck and the element of prediction because you’re always trying to find new audience or new type of acquisition or new country like new GEOs for your applications. You’re always to find how to scale your business and how to get more customers inside your system. And so this, I think, that just programmatic buying are artificial intelligence systems, this all helps the marketer to make a successful acquisition but still the marketer should say to the system, Please can you search for this type of customer, can you show them this type of creatives and I think that’s the future of the users acquisition manager to think what to show and what to suggest to the certain type of customers situated in some country of some age, of some gender, with certain habits and so on and so forth. So he needs to choose and none of still but I think in the future it’s coming, but right now none of our artificial intelligence system will answer you the question, What type of creatives you need to show to a woman, aged, for example, 34, having reading and dogs and habits living in Thailand, in Bangkok. That’s what she thinks, study, develop and so on and so forth, because you need to go into deep, what those type of customers like, what do they browse, how do they use applications, what applications are installed on their phones, where do they go, what do they like, what kind of books do they read, what job positions are they having, and so on and so forth? So you need to collect all the data about their behavior and then suggest what to show them, how to attract them actually. To your point, though, I mean, it’s granted, AI does have its place in marketing, absolutely, but as you’re saying, you know, you have to ask the data the right questions too, the data isn’t just going – you have to figure out how to formulate a question and explore that so that you can get the answer in the data and, as you were pointing out – everyone is very multi-faceted and understanding that is going to allow you to come up with the right campaign, right creative. And the point I’m seeing more and more is that people, because they’re so multi-faceted, you have to think outside the box about where and how you would advertise to them. So, to your point about the woman who loves to read, maybe the place to advertise to get this type of person interested in engaging again with your app would be to think OK, maybe something inaudible, maybe she’s listening to the books, she loves books so much, she might be listening to podcasts of books. You have to think about where you can connect with these users. Is that what you do in your approach to UA and also to engagement for that matter? Absolutely right and in this case, different programmatic systems and artificial intelligence is helping us because right now you do not need to think about where to find this woman, you need to point out that I need this woman because we do have the great conversions on her and the programmatic will definitely help us to acquire her in the right place at the right time. So, if we speak about the Moring acquisition, he said with co-creation, between, say, the marketers should cooperate with the programmatic platforms and cooperate with the artificial intelligence and these two systems of great help for us with the marketers to make the successful acquisition. So, there, all those systems should be your closest friends giving you the right answers on your assumptions. But still, the assumptions should be made by a marketer. So how do you do that in your job? You’re Head of Mobile so you have to be watching, you know, a lot of different moving parts and also motivating your team. How do you motivate them to look at the data differently and embrace programmatic because for many, it’s daunting, some people maybe don’t quite get it? What are you doing to bring that message to your team and get them to sort of rally around AI, data and programmatic? So, it’s a matter of experience because when you show to your team how it really works and what the results they can really achieve, they’re motivated by themselves seeing how it works. We had an experience with one of the South East Asian countries, quite huge, and we were getting not good results at all but at the same time, one of our competitors, one of the local brands of that market, was just booming and we were trying to figure out how it works, why this dating application is booming, we were sort of just watching them and we thought we were doing absolutely the same. But, it wasn’t. We were simply showing the wrong partners and the wrong video creatives to the wrong audience. We were trying to, we were mistaken with the age and with the gender, and when we just used, downloaded a lot of data and were trying to find the behavior, we were reading about the customers, the traditions, about how families are built in this region and we’ve got a mistake and then we changed that and everything was fixed. So, there simply was the answer, we were showing the wrong creatives to the wrong audience of the wrong region. We kind of figured it out because the click to view rate was high and the audience was just clicking on the banners and watching video and converting into registrations but sales were absolutely awful and the problem was just in the creatives on the first step of the funnel. So, there again, as you pointed out, it’s that data and you could see that they were maybe looking at it because maybe it was just so odd, they’re saying Oh, look at this, this is appearing to me – looking at it, not quite right with their segmentation, with what they would be wanting or what would appeal to them and maybe out of curiosity and there you go, and then the data says No, if you want to get them deeper in the funnel, you have to change your creative, you have to change your approach. So, we understand the power and importance of data, but we do have to go now to a break, Olesia, but listeners, don’t go away because when we come back, we’ll be talking again more about data but a little bit more about AI with some surprising, I think, tips and tricks for you to get started before the wave comes. So, don’t go away, we’ll be right back. Hello, we are back. Welcome back to Mobile Presence. I’m your host, Peggy Anne Salz with Mobile Groove and we have Olesia Kuznetsova, she is Head of Mobile at Social Discovery Ventures. And Olesia you are obviously a person who loves data, loves AI – I’m a little bit like that, maybe not quite in your league but I have a passion for it and I was very excited to learn that your company is not just focused on AI as part of how it does mobile acquisition, engagement, retention, everything in the funnel, but you’re also looking into building, I understand, a research center, institute – can you tell me a little bit more about that? Yes, we actually have a research center inside the company which aim is to grow the business, they not about figure out what type of audience will convert to another one – their main purpose that created this institution to grow the business. Where to go, what are the trends, what the behavior is, what are the likes of the future audience, what they’re going to do after two, three, four or five years, or so on and so forth. So, we’re trying to predict the possible models and the future models of dating inside our company. Well, you know, I’ve been doing some research too, right, you’re not the only one. I’m actually prepping for an AI report, doing actually a webinar upcoming for VentureBeat, and looking at AI, in this case, it’s with content marketing, not just app marketing, but I just wanted to check this out with you, little bit of a reality check – a recent survey of marketers, where they see the opportunities in AI, why they’re investing, where they’re investing. So, top of the level here, they see it as being a way to increase efficiency, they see it 50% generate new opportunities they might not have seen before, a little in the high 40s, new innovation, high 30s increased sales, cost savings – these seem to be the reasons that marketers are focused on AI. What do you make of these findings, does that sound like what’s motivating you over at your company? All those, if I’m not mistaken, four points motivate us because they’re basic function of the artificial intelligence, AI, is to increase sales, decrease costs and predict a better funnel to the conversion rates and so it’s increasing up the sales. The second one is like the prediction of the, I told you before that we are trying to predict the future of dating and to try the models that will be suitable for our future customer, not we have right now. And the third part is about the innovations, how to applicate new products, all their, for example, internet of things was my home devices are to our industry, how to use them to maximize the revenues to make all customers happier. So, that’s it. And we also use the artificial intelligence, not only like we were speaking about user acquisition, but we also use it within the customer success department, which is trying to help customers to resolve their problems and to make their communication on the platform brighter and more successful. We also use it for the prediction of their visibility things and so on and so forth. So we try to applicate it and to implement it inside each part of the business to get alternative results and not only based on our assumptions like we think we do have an experience, we think that it will work and we’re also trying to fix, trying to get the information from their IE systems. That’s fascinating, Olesia, and that’s why I’d like to have you back at some point to see how you are progressing with that because we’ve had a lot of guests on the show talking about AI, talking about machine learning, talking about the impact on marketing but you are one of the first, if not the only so far to be researching it, making an institute, making it so much a part of your company. I think that’s fascinating and probably a lot of key learnings that you can share when you come back. So, in the meantime, you’ve talked a lot about a lot of really interesting topics, engagement, reengagement, AI – what about our listeners, if they want to stay in touch with you, if they want to connect with you, if they say this was really fascinating – how would they best stay in touch with you to continue the conversation if they want? The easiest way is to drop me a note on my email or contact me with LinkedIn, so I will be happy to answer questions and to share some ideas because I do think that our market should share the information because it leads success, better success and to better results. So the sharing economy, the knowledge sharing is the future, right now. So, it’s easy just to drop me a note. Perfect, I couldn’t agree more. And of course, we’ll have those details in the show notes with the show. And also some other details where to look for you because you, of course, have your own dedicated page also over at Liftoff, at heroes.liftoff.io where we can read up on you and of course all the other amazing Heroes in the series. So, definitely, going to keep the conversation going with you, Olesia. And that, my friends, is a wrap, so the next weeks, of course, will be jam-packed with other Mobile Heroes from other companies so stay tuned. And if you want to keep up with me throughout the week or find out more about how you can be a guest or sponsor on Mobile Presence, then you can email me, peggy@mobilegroove.com. And that, my friends, is a wrap of yet another episode, you can check out this and all other earlier episodes of our show by going to webmasterradio.fm or you can find our shows on iTunes, Stitcher, Spreaker and iheartRadio simply by searching Mobile Presence. So until next time, remember, every minute is mobile, so make every minute count.